John R. Coyle Jr. offers a review of Geoffrey Shaw's The Lost Mandate of Heaven: The American Betrayal of Ngo Dinh Diem, President of Vietnam in the Washington Times. Camelot was with us for only a bit more than three years, before it went shimmering off into legend. But during its brief existence, the Kennedy administration managed to do disproportionate damage to our foreign policy and reputation in the world. And according to Geoffrey Shaw, our role in Vietnam represented another near-perfect failure with much broader consequences. Among the missteps: sharp military escalation and the deepening involvement in the country’s government, in the process overturning the carefully balanced Indo-China policy established by the Eisenhower administration, and ultimately leading to the sanctioned assassination ofNgo Dinh Diem, the first president of the Republic of South Vietnam. 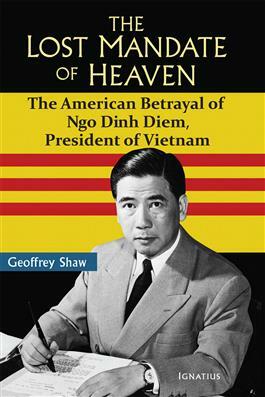 It’s the thesis of Mr. Shaw, a respected authority on U.S. diplomatic and military history in Southeast Asia, that President Diem, possessing the Confucian “Mandate of Heaven,” a moral and political authority that was widely recognized and accepted by the Vietnamese, was a man of great personal integrity who was successfully defending his country from Communism while fighting off Western attempts to usurp his governing authority. On Nov. 1, 1963, Gen. Duong Van (‘Big”) Minh, with Washington’s tacit approval, led an attack on the presidential palace. Diem surrendered a day later, and on Nov. 3, he and his brother were murdered in the back of an American personnel carrier. I wonder if historians will ever sort out the triumphs and failures of the Viet Nam era. However, your spotlighted book seems like a good place to start. Thanks for your posting. In my piece I offer the views of Raymond K. Bluhm, a retired Army Colonel and the editor of "The Vietnam War: A Chronology of War" and Philip Jennings, a former Marine Captain helicopter pilot and the author of "The Politically Incorrect Guide To the Vietnam War."